All of the major television networks use their primetime entertainment shows to push a pro-gun control agenda. Liberal television executives apparently think that they have the power to change Americans’ attitudes. Not liking guns has been portrayed as cool for a long time. It is an old theme that dates back to the original 1980s MacGyver series, in which the titular character avoids using guns and expresses his aversion to them. This theme has continued with the current remake. But the push to sway public opinion really seems to have picked up. This spring on ABC’s “The Crossing,” the sheriff’s young son says, “I don’t like guns” when a deputy suggests he may someday replace his father. The deputy appears discomforted by the exchange. In NBC’s “Reverie,” main character Mara Kint (Sarah Shahi) is traumatized by the shooting deaths of her sister and niece. The deaths are played repeatedly throughout the show. In the second episode, which aired last month, Kint throws a gun into the ocean and explains that she has had training with guns. When asked why she threw the gun away she says that she “hates guns.” This scene touches on multiple gun control points in just 15 seconds. It’s a tight race, but NBC might just be the worst network. It seems to have given out orders for its TV shows to include some anti-gun or pro-gun control mentions. This April, an episode of “Taken” (Season 2, Episode 11) tried to convey to viewers that gun-free zones work because the criminals obey the bans. Do viewers really believe that a group of professional killers couldn’t find some way to get guns into a hospital? Mass public shootings actually almost always occur in gun-free zones. Since 1950, that's been true of 98 percent of incidents. This happens precisely because criminals prefer unarmed victims. In March, the NBC show “Chicago Fire” (Season 6, episode 15) contains a scene where stored ammunition catches fire. Bullets fly everywhere, causing firemen to think that a sniper is targeting them. One of them is seriously wounded. It is hard to believe that anyone would want to have a gun in their home after watching this scene. But it is complete fiction. A gun barrel is needed to propel a bullet forward. Outside of a gun, the gunpowder in a bullet would simply explode in all directions, which wouldn't generate much speed in any particular direction. A February episode of NBC’s “The Black List” (Season 5, episode 13) begins with a group of people accusing a gun maker of providing inexpensive guns that “have no value to anyone but criminals.” The gun maker is accused of making sales that “drive up homicide rates,” further increase the demand for his product, and bring in “blood money.” There is even a dig about how the law protects the gun maker from being sued, to which his only response is that everything he's doing is perfectly legal. No one mentions that poor people — particularly poor minorities — are the most likely victims of violent crime and rely on inexpensive guns for self-defense. NBC’s “Chicago P.D.” shows no less egregious bias in an episode from this February (Season 5, Episode 13). Gang members threaten a small business owner, who a police officer advises to leave his permitted concealed handgun at home. The owner doesn’t follow this advice, and the gang ends up killing him, his gun lying next to his dead body. To leave nothing to viewer imagination, a later scene shows surveillance camera footage of the businessman being beaten to death because he drew his gun on the gang members. You wouldn't know it from watching the show, but having a gun is the safest course of action when confronted by a criminal. The police can’t be there all the time to protect people. But the show only sends the message that the man would still be alive if he'd left his gun at home. NBC isn't alone. In January, just in time for congressional debates over concealed handgun reciprocity, CBS’s “Hawaii 5-0” shows an unhinged concealed handgun permit holder unsuccessfully trying to kill someone. Later, the permit holder proudly proclaims to the police that his permit makes it alright for him to have his gun. Contrary to this depiction, permit holders are so law-abiding that they are convicted of firearms violations at much lower rates than even the police. 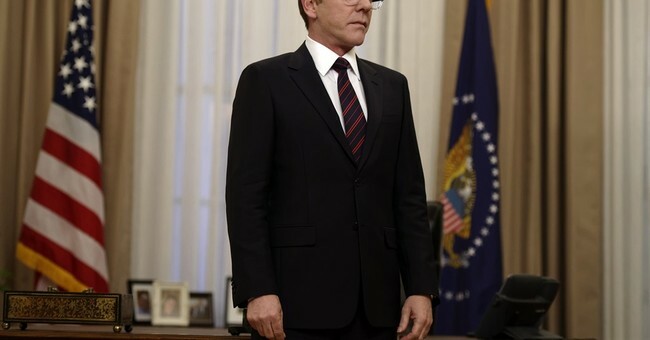 In ABC’s “Designated Survivor,” the U.S. President (Kiefer Sutherland) takes a question from a woman whose daughter was killed by an ex-boyfriend who’d been in prison. The woman claims that background checks would have stopped the ex-con from buying a gun. But there's a great volume of research which finds that background checks don’t reduce crime. And virtually all of the 3 million people who have been stopped by background checks from buying a gun are law-abiding people whose names are confused with those of prohibited people. Background checks are expensive, and the costs are most difficult to bear for poor individuals. But it's so much easier to just take a simplistic, black-and-white view of the gun debate. The issue is framed as one side of people desperately trying to pass lifesaving laws and on the other side are Republicans who use lies to derail common sense gun legislation. It is bad enough that most news networks provide only one side of the gun control debate. But now even some entertainment shows have become vehicles for gun control propaganda. If the networks’ only consideration is really just entertainment value, there would be more scenes of concealed permit holders acting heroically.